A red T-shirted team of athletic women had disembarked at Galle International College. Tanned by the sun and salty Indian Ocean winds, they lit up the school auditorium where the students waited eagerly to hear their story- an extraordinary saga featuring a wonder woman, a kind king and a unique yacht that can claim to be a proud prima donna in the history of yacht racing. The yacht is the ‘Maiden’, and the young women from around the world who sail on it today are carrying a potent message: that girls around the world deserve an equal right to education. 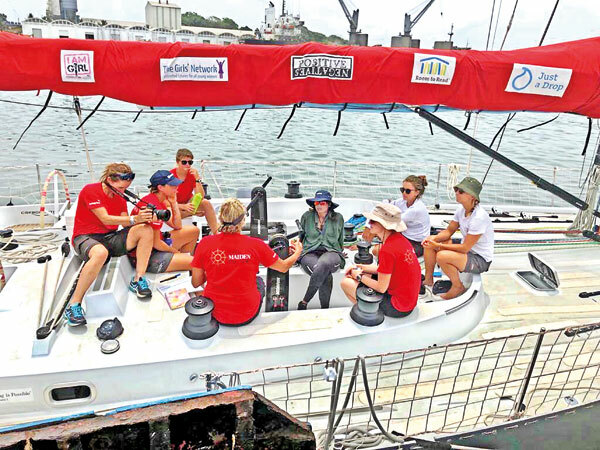 With a three-year circumnavigation across the globe, they want to ensure that this message is driven home, and that all girls are allowed the basic right of having access to proper schooling. It all began in the early ’80s. Tracey Edwards was the steward of a boat doing the Whitbread Round the World Race (now called the Ocean Race). She was in love with life at sea and her dream was to participate in the race as skipper, on a yacht with an all-female crew. But assembling an outfit of girls turned out to be the most easily solved of her problems. They had to buy a boat. Tracey decided on a yacht called Prestige, 58 feet and designed in 1979. She had to mortgage her house to buy and revamp the vessel, yet the biggest challenge loomed ahead. Who was to fund an all-female team- an idea that seemed fanciful and, for many, laughable? Luckily Tracey had made a friend in her steward days. King Hussein 1 of Jordan, who was a ‘people collector’ had been captivated by Tracey and her frank, friendly and brave nature. With a credo that declared “With faith, honour and courage, anything is possible”, the monarch stepped in when he heard of Tracey’s predicament and announced that Royal Jordanian was to be the sponsor. In 1988 Sarah, the Duchess of York christened the boat ‘Maiden’. Next year the Duchess would see them off at the Whitbread race, the first all-female crew ever to square up on start line. The men were betting as to how long they would go before turning tail: days, a week or a leg? But the tough would get going, and Maiden came third in the first leg. Not only did they win three other legs including the Beefeater trophy, but at the end of the race, they were second in their class- the best result for a British boat in 17 years- and unbeaten to this day. The team had survived icebergs, 30 degree below freezing temperatures, frostbite, contaminated gas, no satellite signal for nine days at a stretch, tornados, and the final five days without food. But it was all worth the final jubilation: they had not only proved themselves capable, but also made the horizon a lot bigger for all the women of the world. After that intoxicating victory however, the Maiden had to be sold and the crew disbanded. When next Tracey heard of her beloved boat it was gathering barnacles at Seychelles and playing unwilling host to pirates. Tracey was heartbroken, especially because this was not the afterlife she would have wanted for the Maiden. She had great plans of a munificent dowagerhood for the boat but who was to fund her dreams? King Hussein had passed away by this time, but there was someone who had been inspired by Tracey as a young girl. The old king had been the rock of Tracey’s life and his daughter Princess Haya recalled what an ardent supporter he was of Tracey’s cause. In a magnanimous gesture she agreed to sponsor “The Maiden Factor”- a charity to give equal education rights to girls. Repeating the epic Whitbread journey, the boat plans to lay anchor in 30 cities in 20 countries during their three year voyage. 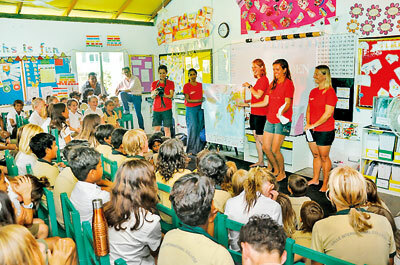 At the Galle International College, the Maiden team’s women sailors explained that 130 million girls worldwide are currently denied an education, drawing sober looks from the young audience. In a lusty chorus, the young people pledged to be the ambassadors for Maiden Factor. Prior to this presentation, the Primary 6 girls of GIC had visited the boat to put their handprints on the sail, as happens at each port of calling. Following the talk, each student will also contribute the Maiden Factor team with a small message. These ‘messages of hope’ are used to spread the word on why girls need schooling- for in many parts of the world it is thought they can do without it; that their lot is by the hearth. As one message from a far shore read, “if you educate a girl, she will educate her family and community and that is how you change the world.” The Maiden Factor believes that this kind of thinking can go a long way. They have joined with a number of other charity organisations. They fundraise for projects but also stated in their mission that, “with Maiden Factor’s high profile we can promote the issues currently facing the organisations with whom we work. The Maiden Factor is a hub with the potential to link fundraisers with the organisations actually making a difference and to involve fundraisers, individuals and organisations, in real time programmes and events”. The image of the woman sailor is one of the most liberating and empowering you can have, holding herself over the waves away from terra firma as she braves wind and gale. Gazing into the face of a solemn little girl in the audience in whose eyes danced a fierce gleam as she listened rapt to the tale, I could fathom, for a moment, just how indomitable their story alone could make their fellow sisters: damsels at the helm- not in distress.